The internet functions as the master machine controlling human brain function creating a netocratic society and state. The internet exposure leads to low level EMF fields, formation of supramolecular porphyrions and nanoarchaeal abiogenesis. The nanoarchaea contain magnetite and are magnetotactic and can have quantal perception as well as low level EMF perception. This leads to more of brain endosymbiotic nanoarchaeal growth. The nanoarchaea are capable of methanogenesis which contributes to global warming and further endosymbiotic archaeal symbiosis. The widespread use of internet leads to increased endosymbiotic archaeal growth and porphyrion synthesis modulating and changing human brain structure and function. The internet functions as the master of the human brain leading on to the development of a netocratic state controlled by master machines manifesting as the internet. This alters human society, culture, religion and art and eventually the environment leading to global catastrophe and extinction. 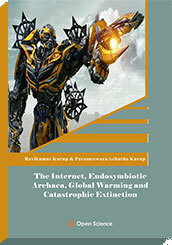 The widespread internet exposure leads to increased endosymbiotic archaeal growth, methanogenesis and global warming. The global warming can increase the growth of archaea in the ocean beds leading to release of methane in ocean beds and shifts in the crust of the earth. This produces earthquakes and tsunamis leading to global catastrophes and extinction.